​Clyde Wilberforce Hoyte, OD was a in a very true sense, a man of the world. He was born as a Danish citizen on November 11, 1915, in Charlotte Amalie, on the Danish Island of Saint Thomas in the Virgin Islands. By the time he was 2 years old the USA bought his birthplace from Denmark making him an American citizen. Due to his family-background he was also entitled to British citizenship as both his parents are born in Barbados which became a British colony at the time of his birth. Furthermore, residing in Guyana from age 4 to 23 made him a naturalised Guyanese. In 1939 Clyde Hoyte moved to Jamaica, where he resided and worked for 64 year, until his death in 2003, which earned him deservedly, Jamaican citizenship. The first stages of his life were strongly shaped by his Guyanese education as Hoyte attended the Berbice High School, New Amsterdam, and went to Queens College in Georgetown, British Guyana. At that time he developed interest and talent in writing. By the age of 15 Clyde Hoyte won the Governor’s Prize for an essay on ‘If I were a Governor’. His first experiences in the area of journalism were also made Georgetown. Between 1936 and 1939 Hoyte compiled and announced the radio news on station VP2MR and VP2BG. A pioneer, he was one of the first to engage in radio news broadcasting. Hoyte also developed an interest in print media being trained and then employed as reporter by The Daily Chronicle Newspaper, Georgetown (1933-1939). In 1939, Clyde Hoyte arrived in Jamaica and became the first radio news compiler and announcer for the first government owned radio station ZQI (former VP5PZ, now RJR) which was initiated as a reaction on the outbreak of World War II. The first local newscast in Jamaica was read by Clyde Hoyte on June 3, 1940. He further pursued his journalistic activities in Jamaica by starting employment at The Gleaner in 1939, later becoming the first manager of The Gleaner’s Western Bureau in Montego Bay in 1949. With his work Clyde Hoyte always strived to deliver reports in a comprehensible manner. He did so for many years at the Jamaica Information Service (JIS) where he compiled and moderated Radio and Television Programmes. In order to reach even the youngest Jamaicans he started his own children’s newspaper, The Young Jamaican. In 1944, when Jamaica was preparing for its new constitution with a full ministerial system Clyde Hoyte was asked to write the book ‘The New Constitution Simply Explained’. Further publications of Clyde Hoyte are ’History of the Jamaica Agricultural Society’, covering 60 years of its history, ‘Man of Destiny’, a biography of the Hon. Norman Washington Manley and biographies of the life of Willie Henry and Jimmy Tucker. Between the years of 1945 and 1954 Clyde Hoyte operated his own printing business ‘The Western Sun’ and became subsequently editor at the City Printery in Kingston. In 1949 he co-founded the Jamaica Junior Chamber, which was started in Montego Bay with Hoyte as secretary. In this position he travelled with the president, Mr. Frank Parkin, to Trinidad, Barbados, Grenada and Antigua in order to launch the Junior Chamber Movement there. 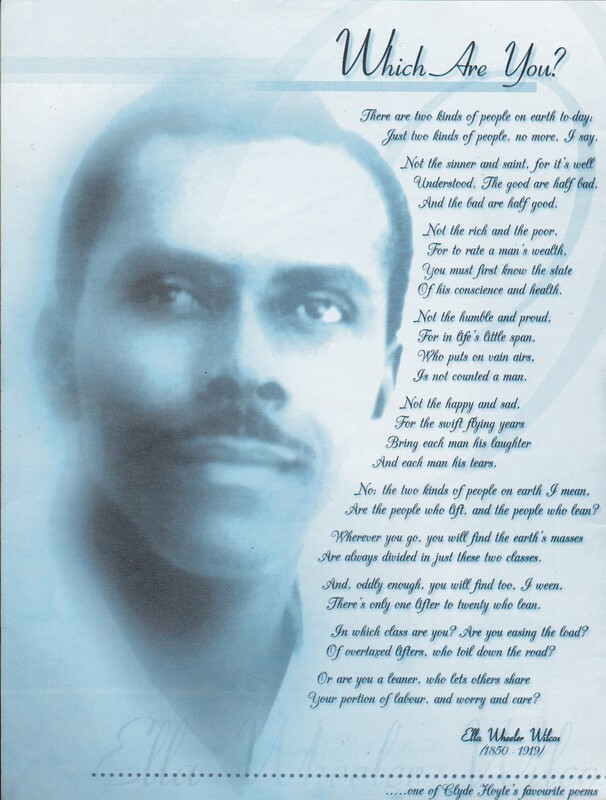 In the late 1940s, Hoyte began to compose anthems, hymns, patriotic songs and mento tunes aimed at promoting peace and harmony in Jamaican society. Some of today’s most popular pieces composed by Hoyte include the Christmas Carols Jamaica Noel (No Snow on our Carib Island) and O’er our Blue Mountain, the songs Sweet as a Dream, Have Faith, Out of Many One People, Away With Violence, See God In All, I Will Lift Up Mine Eyes, Something Bigger, Going Home, Plenty Road, Daphne Walking, Show Your Soul, Old Firetick and the powerful and emotional Jamaica Calling. Through these compositions Clyde Hoyte became a pioneer in the fledgling Jamaica recording industry. In 1955, Clyde Hoyte wrote music for the first Hollywood movie filmed in Jamaica, Manfish and became the first composer of commercial jingles in Jamaica. He regularly sang, danced and played the piano in hotels in Jamaica and for a short time even at a prominent night club in New York City. RCM Music Foundation (now Music Unites Jamaica Foundation) assisted Clyde Hoyte during the last years of his creative life and organized in his honour in March 2003 the ‘Away with Violence’ Gala. 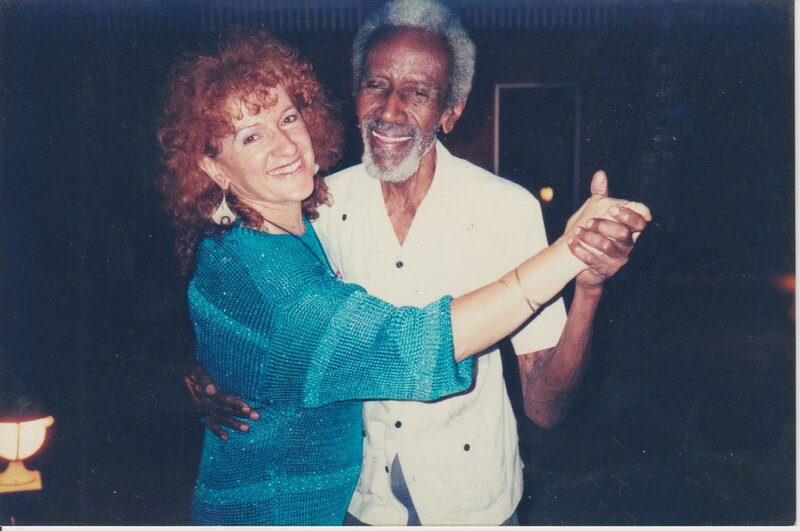 Many celebrated musicians of Jamaica took part, performing most of his well known songs and Clyde Hoyte himself at age 87 participated with a fascinating dance with lights. Another remarkable achievement of Hoyte was the establishment of the ‘Clyde Hoyte Talent Centre’ which was committed to train physically and mentally challenged persons in the designing and production of handcraft. In this project harmony, self-reliance and caring for others were stressed. Having grown up in different cultural backgrounds, Clyde Hoyte always promoted the principle of equality. This is also reflected in his journalistic work with which he tried to reach everyone. He made efforts for the ‘United Nation World Motto Project’ with his suggestion “Remember All Are One”. This motto can be said to be a basis of Clyde Hoyte’s life and work as he embodied several citizenships and promoted international collaboration. Clyde Hoyte delivered personally to the United Nations a very large wall carpet with his slogan “Remember All Are One”, which was handmade by him, as he was a master in crochet. This reminder on his passion for unity amongst nations has been exhibited for many years at one of the UN City offices in Vienna, Austria. In later years Jimmy Cliff used this as the refrain for his hit “We All Are One”. Clyde Hoyte was committed to serving humanity with his work and visions throughout his life. 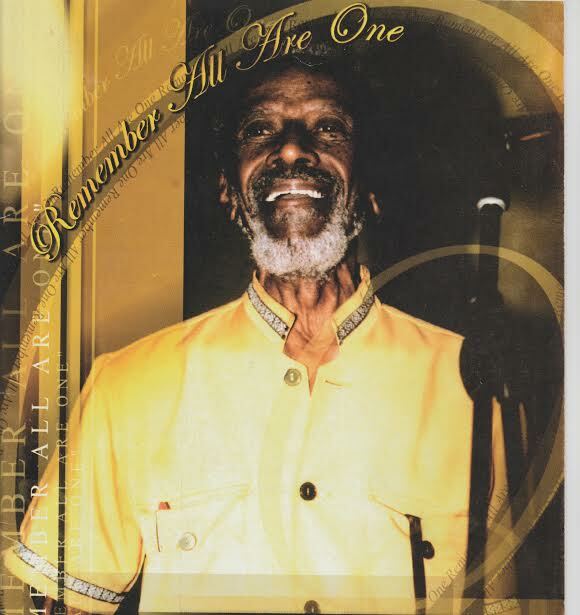 As a free-lance journalist, he continued submitting articles to the Jamaica Gleaner until the time of his passing on November 14, 2003, at the age of 88. His work will continue to engage Jamaicans and Caribbean people for many years to come. Former Governor-General, His Excellency the Most Hon. Howard Cooke wrote in his tribute “It is true that his genius lay in writing poems and lyrics and putting music to them, but his urgency was to interpret what God wanted for His people. His anxiety was not for material benefits, he just wanted to create material that could be used to uplift and guide others to reach out and do good”.